“We had a goal-setting session at the start of the year,” Vancouver Island Mariners’ head coach Matt Kuzminski began. “And that’s when we talked about it, that’s when we said we have a destination to win the national championship in March in front of our families and our friends at the LEC. Final score: VIU 85 Sheridan 82. Yet Nanaimo’s never-day-die Mariners, the team that made miracle comebacks seem like their birthright here this week at the national tournament, had to take a slightly different path Saturday night against Oakville’s Sheridan College Bruins in a hotly-contested championship final played before a near-capacity crowd at the Langley’s Event Centre’s south court. On Thursday, the M’s rallied from an 18-point deficit to defeat Calgary’s SAIT Trojans 102-84 in the quarterfinals. On Friday, they rallied from 19 down to defeat Montreal’s Vanier Cheetahs 85-83 in the Final Four. On Saturday, however, the script was flipped. The Mariners jumped out to a 14-point first-quarter lead (23-9) to start the game, then pushed it back out to 15 points (41-26) in the second quarter. This time around, however, it was the opposition which provided the pushback as Ontario’s OCAA champion Bruins outscored the Mariners 25-12 in the third quarter and built a lead as large as six points (63-57) heading into the fourth quarter. 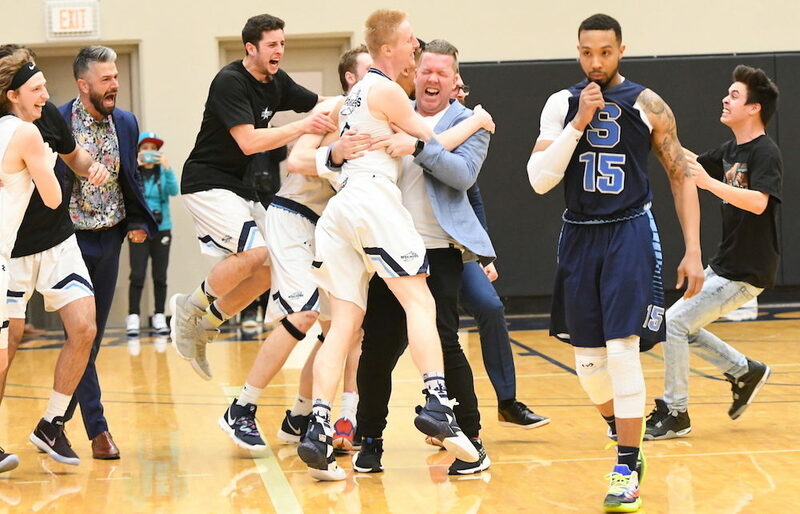 Clearly, after what VIU had managed in both of their national tourney comeback wins, and of course by rallying over the final two seconds to force overtime en route to a CCAA-qualifying win over league rival Douglas College in its PacWest conference final, a six-point deficit wasn’t about to give them heart palpitations. Could the Mariners find it within themselves to reach the same kind of emotional peak they had managed in their last three games, all of the must-win variety? Was it too much to ask of them to go to the same well a fourth straight night? And as good as they had been, did they have the combination of nerves and athleticism to cope with the kind of pressure schemes the Bruins were sure to dial up on defence? The answers to both questions, of course, was a definitive ‘yes’. Yet on Saturday, when push came to shove over a fourth quarter in which the Mariners were either going to rally or perish, it was their will to win which wouldn’t let them choose the latter. 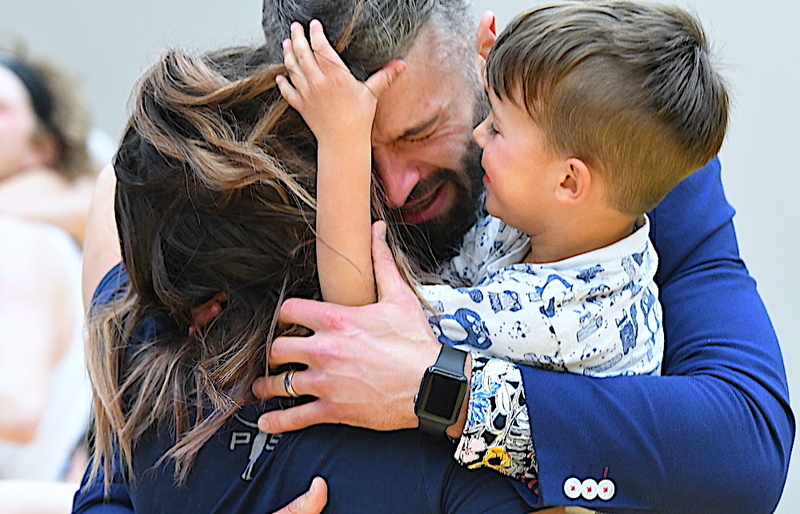 “We knew at halftime, because of the quality of team that Sheridan was, that it was going to be tough,” said Kuzminski, who had spent the past five seasons in an elusive chase to recapture the national crown he had won after his first season (2012-13) at the helm of the program. Yet Saturday’s third quarter, a minus-13 in points-differential, was their worst of the entire championships. 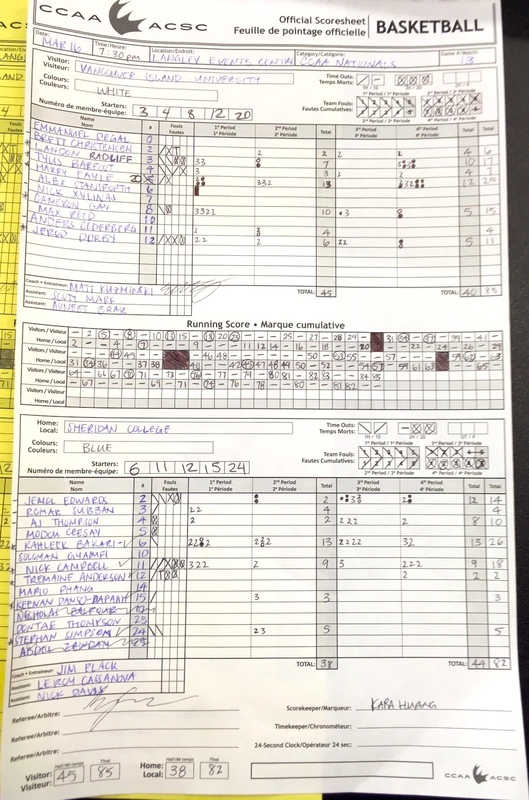 Computer-generated box scores are terrific, but so too are the hand-written score sheets, especially as they pertain to the running score and foul tallies. This one is expertly done. Over a magical three days at the LEC, in fact, that belief was in such abundance that when the switch was flicked in the fourth quarter, you could verify the hunch that something had changed simply by comparing the contrasts scribbled in the game’s running scorebook. 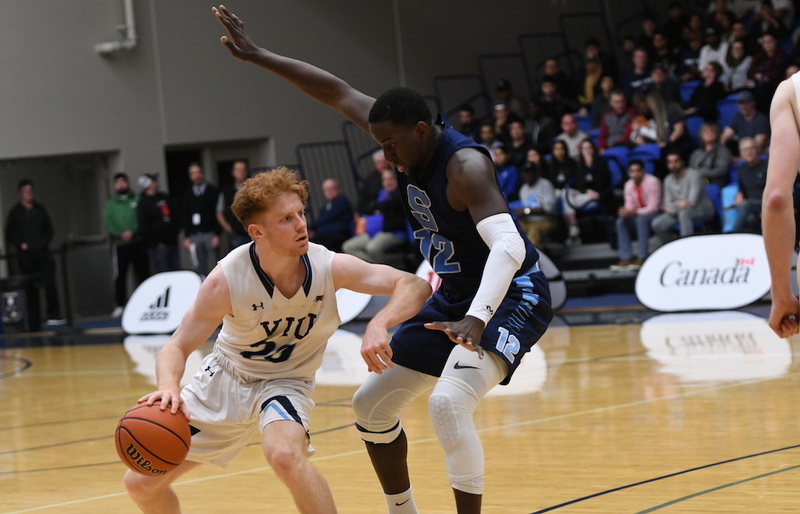 Over the second and third quarters of play, in which they were outscored by a combined 43-28 margin by Sheridan, VIU was so passive in the half-court that it took just four total free-throw trips, going 2-for-4. Yet in the fourth quarter, with its vaunted guard trio of Landon Radliff, Harry Fayle and Cameron Gay all deciding they needed to return to their regular levels of aggressiveness, the team’s entire tenor changed. The Mariners took 13 free throw trips, all coming over the final eight minutes of the game, and they went a focused 11-of-13. Fayle, the Aussie native who scored a team-high 25 points and was picked the Player of the Game, led the charge. Not only did he go a perfect 5-for-5 from the stripe over the final frame, including a pair to make the 85-82 final complete with 1.2 seconds remaining, he completed a three-point play from the charity stripe to tie the game 67-67 with 7:35 left, then hit the step-back trey with 7:15 left that put VIU ahead to stay at 70-67. Fayle scored 12 of his 25 in the fourth quarter, while tourney MVP and PacWest regular-season scoring champ Radliff scored 10 of his 17 over the final frame. 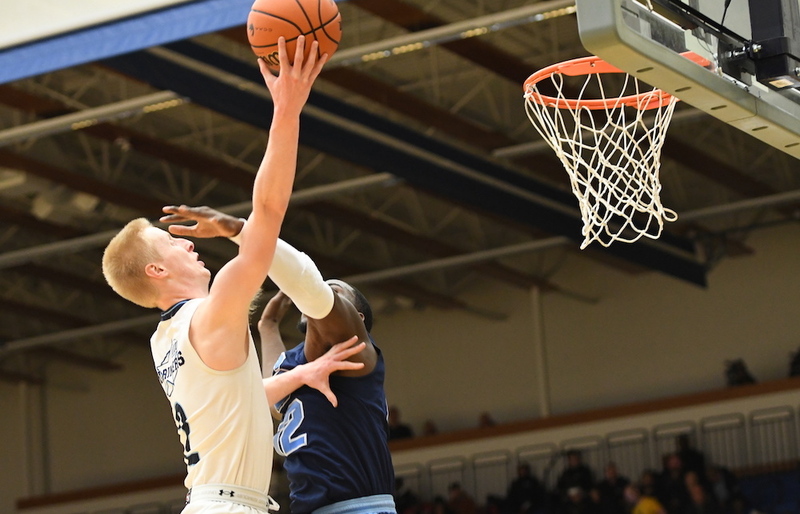 Radliff’s final quarter was also clutch, especially his three-pointer with 4:52 left to make it 76-71, the five-point lead representing the Mariners’ biggest advantage of the second half. He was also clutch when Sheridan’s best three-point shooter, Nick Campbell, committed his fifth foul trying to guard him. Radliff hit both of his free throws with 15.6 seconds remaining for a three-point lead (83-80) after the Bruins had gotten to within 81-80 on a follow-up lay-in by Jemol Edwards. 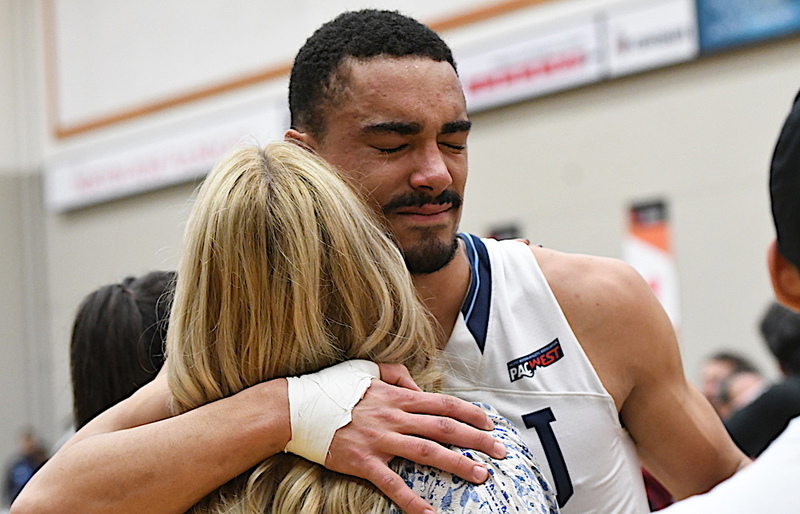 VIU’s Gay had fouled Edwards who was attempting a three-point shot with 3.2 seconds remaining and the Bruins trailing 83-80. Edwards, however, after making the first of three free throws, missed the second. He made the third to make it 83-82. Sheridan called for time, then subsequently fouled Fayle, who made both of his free throws for an 85-82 score with 1.8 seconds remaining. If anyone seems due for a title, it’s Sheridan, who last won it all in back in 1990. The Bruins were led by the game-high 26 points of Kahleek Bakari-Whyte, the 18 of Campbell, 14 more from Edwards, and 10 from AJ Thompson. Harry Fayle came to the team two seasons ago from Australia. Both Landon Radliff and Cameron Gay arrived this year from the NWAC, Washington’s extensive community college delivery system. Tyus Barfoot and Anders Cederberg are both hometown Nanaimo District Secondary grads. Brett Christensen is the Langley kid, a star who won the B.C. Quad A high school title during his days with Walnut Grove Secondary at this very same LEC complex. And senior post Jerod Dorby, a Duncan native and the team’s only fifth-year senior, was able to end his college career with a storybook finish. Coach Kuzminski, a Nanaimo native who played for his hometown Dover Bay Secondary team before playing university basketball at both Victoria and Simon Fraser, put his old high school coach Mark Simpson in charge of the defence this season. The theme here? How Kuzminski searched near and far to bring a special group of players and coaches together. And the thing this Coach K stressed the most? 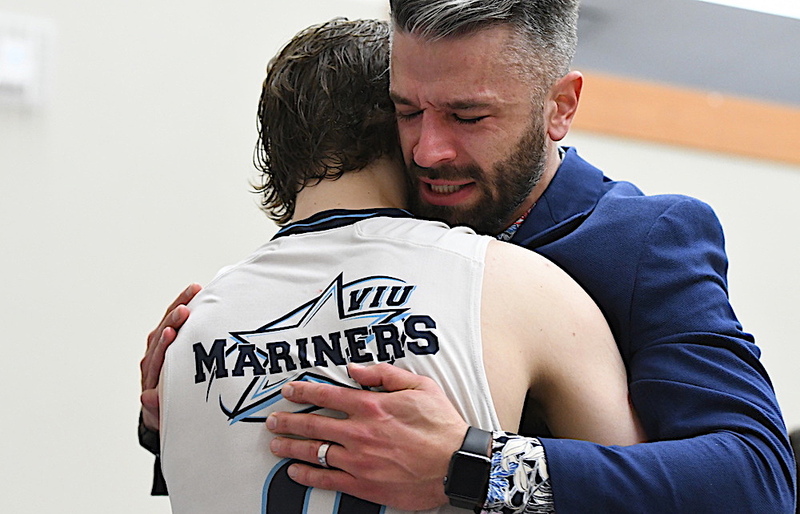 If you’ve been trying to crack the case as to how it was that Nanaimo’s VIU Mariners were the last team standing Saturday night, the ones able to make literally every big play they had to make in order to win four straight championship-elimination games and ultimately capture the CCAA national title, well, that’s your answer. While the theme may seem common, this was the kind of basketball team you had to watch in person to fully appreciate how much they believed in, and leaned on each other. It’s a safe bet to say that’s why the post-game session of hugs threatened to never end. They had overcome too many obstacles, too many deficits, to ever be called anything but rare.